To experience the diversity and creativity of San Francisco through the eyes of a local, there’s no better neighbourhood to start in than The Mission. This colourful district is loud and proud about its eclectic roots, and you’ll see the locals passion for their heritage and neighbourhood everywhere from their artisanal food stops to their bold wall murals. It would be impossible to choose your favourite dish in The Mission, but your local will take you to food trucks, bakeries and taquerias where you can certainly try! And if the explosion of flavours and cuisines you’ll find here isn’t enough, you’ll also discover the history and personality of this neighbourhood through its renowned street art, which tells the story of The Mission and its locals in vibrant graffiti, painstakingly painted murals and riots of colour! Begin your experience with a coffee and artisanal donut from the locals’ favourite artisanal donut joint - with their organic and sustainably sourced ingredients, you’ll want to they every flavour from classic sugar and cinnamon to maple bacon! 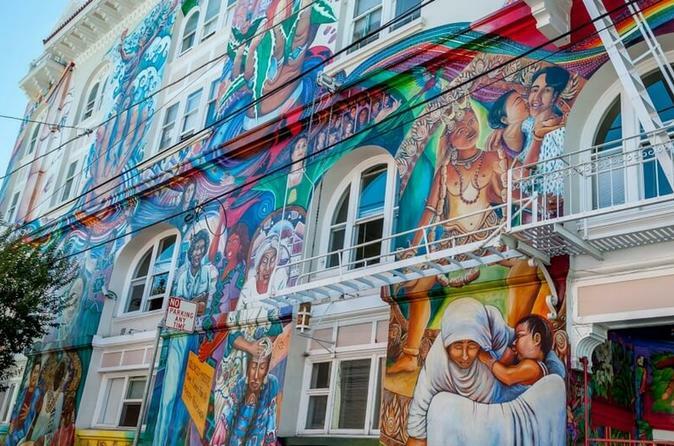 Stroll through the neighbourhood to get a feel for its spirited atmosphere and discover The Mission’s heritage through its street art - your local will take you to Clarion Alley and Balmy Avenue, whose murals date back over 30 years and bring to life the neighbourhood’s history. These expressive pieces of street art which adorn every free space along these streets share the area’s Latin American heritage as well as reveal more recent gentrification. As well as discovering incredible art, continue to eat your way around the neighbourhood and taste some of its Mexican favourites! From pan dulce in a Mexican bakery to the best tacos in the state at a beloved taqueria, as well as stopping by a famous food truck, your taste buds would swear you were in Mexico! Follow your Local Host as they lead you through local Latino markets, past street vendors, and into stores selling luchador masks, making you feel like you’ve been transported to the streets of Mexico City, before you end your experience by indulging in velvety smooth ice-cream from the locals favourite creamery!